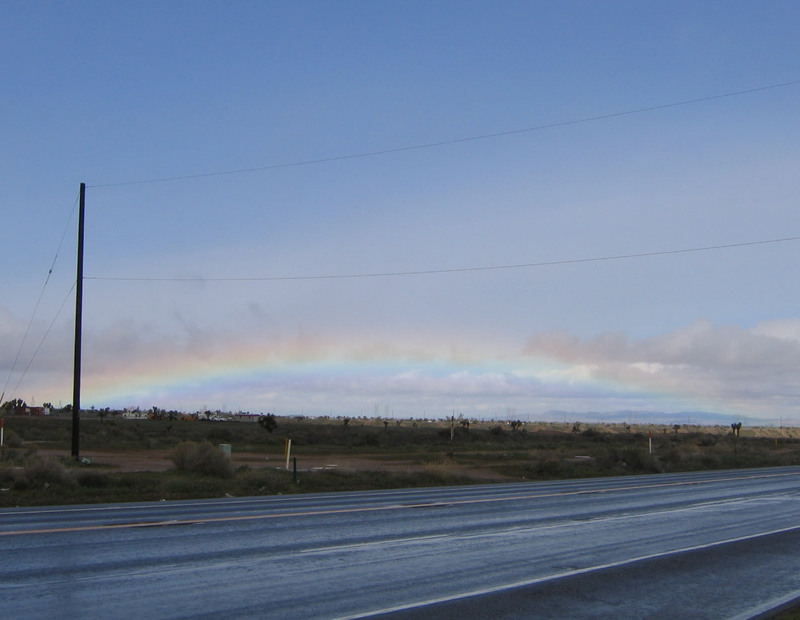 On a rainy afternoon in the Mojave Desert, a rainbow crests in the distance beyond U.S. 395 near Adelanto and the Interstate 15 interchange during a particularly wet winter. Photo taken 02/20/05. U.S. 395 is a major north-south route that traces the eastern slope of the Sierra Nevada and Cascade Mountains for its journey through California and Nevada. U.S. 395 begins at its interchange with Interstate 15 in Hesperia (Exit 141) and travels north along the Three Flags Highway along the Eastern Sierra. The highway enters the state of Nevada to serve Carson City and Reno-Sparks, then reenters California southeast of Hallelujah Junction. From there, U.S. 395 continues north toward Susanville and Alturas, then leads into Oregon and Washington state before reaching the Canadian border. Much of U.S. 395 is only two lanes wide, but increasing traffic demands have resulted in expansion of U.S. 395 to four lanes in many areas, especially between the California 14 merge near Inyokern and popular resort Mammoth Lakes (California 203). Only one business loop exists along U.S. 395, and it connects the highway with the city of Ridgecrest in eastern Kern County. It follows South China Lake Boulevard north into Ridgecrest, then turns west along with California 178 to return to U.S. 395 near Inyokern. AASHTO approved the designation of U.S. 395 Business from an application by the state of California on June 7, 1989. While the old alignment of U.S. 395 travels through downtown Inyokern and does not have a business route designation, the path through Ridgecrest was never an old alignment of U.S. 395. It consists of a Kern County-maintained route and California 178. An old business route through San Bernardino and Colton was created with the construction of a freeway alignment, but it was eliminated when U.S. 395 was retracted to Adelanto and Hesperia. Former U.S. 395 Business today is not a designated business loop of Interstate 215, but the old alignment remains part of the urban street network in those two cities. U.S. 395 was originally a U.S. route in Washington state that was extended south. The extension south into California and Nevada came in 1935. It replaced portions of several then-existing state routes: Former California 71 from San Diego to Lake Elsinore, California 74 from Lake Elsinore to Perris, Former California 18 from Riverside to San Bernardino, California 95 from Hesperia to Inyokern, and California 7 from Inyokern north to Bishop. It also overlapped U.S. 66 (and U.S. 91) between San Bernardino and Hesperia). U.S. 6 was also extended into California in 1937, making route continuity through the Eastern Sierra. At its longest, U.S. 395 extended south all the way to San Diego. However, U.S. 395 was replaced by Interstate 15, with most signs being removed south of Hesperia in 1973. The point of truncation was its interchange with Interstate 15 in Hesperia (Exit 141). The route originally started at the intersection of Market Street and 12th Avenue (now Park Boulevard) in downtown San Diego (along a shared segment with U.S. 80). With the construction of Interstate 15 and Interstate 215 through San Diego and the Inland Empire, U.S. 395 was decommissioned in San Diego and Riverside Counties in the 1980s. The original routing of U.S. 395 (1935-1938) started at the intersection of U.S. 101 (Morena Boulevard) and Linda Vista Road. It then turned northeast along Linda Vista Road, joining the Interstate 15 corridor near Miramar. In 1938, U.S. 395 was rerouted again, and this alignment lasted until the opening of the Cabrillo Freeway (current California 163) in 1948. On the 1938-1948 alignment, U.S. 395 started in downtown San Diego, followed U.S. 80 along Market Street, Park Boulevard (including former 12th Avenue), and El Cajon Boulevard to the Fairmount Avenue intersection. From there, U.S. 395 turned north on Fairmount Avenue, crossed the San Diego River via the Ward Road bridge, and followed today's Interstate 15 (former California 103) alignment through Murphy Canyon north to Miramar. The Cabrillo Freeway was constructed between 1942 and 1947. By 1948, U.S. 395 was moved to the Cabrillo Freeway (today's California 163) between downtown and Kearny Mesa via Balboa Park, Mission Valley, and Linda Vista. U.S. 395 remained on this alignment until the route was decommissioned in 1973. We have pages dedicated to the historic U.S. 395 route, including both directions of the route in San Diego County. For a great deal more on Historic U.S. 395 through San Diego, Riverside, and San Bernardino Counties, including the old alignments of the route through San Diego, Riverside, and San Bernardino Counties, visit Three Flags Highway (U.S. 395) by Cameron Kaiser. The first reassurance shield for U.S. 395 Business north is an erroneous state route marker. The business route is locally maintained on the north-south leg and part of California 178 on the east-west leg. Overall U.S. 395 Business is well-signed. Photos taken 11/10/08. Northbound U.S. 395 Business meets its junction with California 178 in Ridgecrest. U.S. 395 avoids Ridgecrest, but U.S. 395 Business connects to the city via a county route from U.S. 395 north to California 178 and via California 178 from downtown Ridgecrest west to U.S. 395. This business route was shown on Rand McNally maps in the late 1990s, but it has disappeared from those maps even though the signage remains. There are at least two erroneous California 395 Business shield assemblies along the county-maintained (north-south) portion of the highway. Photo taken 01/20/02. A two-lane bridge carries California 178 over the two-lane U.S. 395 freeway. Photo taken 10/08/06. The next left connects eastbound California 178 with U.S. 395 north to Bishop. Ahead, California 178 and U.S. 395 Business motor east toward China Lake and Ridgecrest. Photo taken 10/08/06. This view looks east along California 178 and U.S. 395 Business toward the power substation. There are no motorist services at this interchange; one must travel east into Ridgecrest or west to Inyokern. Photo taken 10/08/06. California 178 east and U.S. 395 Business south confirming markers posted near a power substation ahead of China Lake. Photo taken 10/08/06. A bevy of power lines criss-cross California 178 and U.S. 395 Business east of the U.S. 395 interchange. Photo taken 10/08/06. A mileage sign along California 178 east and U.S. 395 Business south provides the distance to Ridgecrest (9 miles) and Trona (34 miles). Photo taken 10/08/06. California 178 and U.S. 395 Business carry four lanes east en route to Ridgecrest. This route is at expressway standards with intersections evenly spaced and a 65 mile per hour speed limit. Photo taken 10/08/06. Eastbound California 178 and U.S. 395 Business (Inyokern Road) approach and pass by several intersections, including Saguaro Street, Calvert Boulevard, Margaret Street, and Jacks Valley Road. Photos taken 07/26/09. Eastbound California 178 and U.S. 395 Business enter the city of Ridgecrest, nestled in the sprawling Indian Wells Valley. Incorporated on November 29, 1963, Ridgecrest was originally known as Crumville and sits at an elevation of 2,290 feet. The city had a population of 24,927 people as of the 2000 Census. With its high desert location, summers are hot and winters are cool; precipitation is uncommon through much of the year. One of the main employers of the region is the Naval Air Weapons Station China Lake. Photos taken 07/26/09. A U.S. 395 Business reassurance shield is posted after the Downs Street intersection. No companion California 178 shield is posted here. Photo taken 07/26/09. Eastbound California 178 and southbound U.S. 395 Business approach Norma Street (next traffic signal) in Ridgecrest. Photo taken 07/26/09. Coming close to the entrance to Naval Air Weapons Station China Lake, California 178 and U.S. 395 Business will turn south onto China Lake Boulevard. Photo taken 07/26/09. A separate U.S. 395 Business trailblazer is posted after the initial California 178 guide sign. All non-military traffic must turn right; continue straight ahead into the naval base guard station. Photo taken 07/26/09. U.S. 395 Business and California 178 turn right (south) onto China Lake Boulevard, leaving Inyokern Road behind. Photo taken 07/26/09. Following China Lake Boulevard southbound, motorists see a California 178 reassurance shield. Omitted is U.S. 395 Business. Photo taken 07/26/09. California 178 and U.S. 395 Business split at the Ridgecrest Boulevard and China Lake Boulevard intersection. This sign is posted in the median of China Lake Boulevard southbound prior to French Avenue three blocks north of Ridgecrest Boulevard. Photo taken 07/26/09. A pair of trailblazers are posted between French Avenue and Ridgecrest Boulevard. Turn left for the continuation of California 178 east to Trona and Death Valley; continue straight to follow U.S. 395 Business (China Lake Boulevard) to return to U.S. 395 south to San Bernardino. The remainder of the business route is maintained by the city of Ridgecrest and Kern County. Photo taken 07/26/09. U.S. 395 Business reassurance shield (erroneously showing California 395 Business) located along southbound China Lake Boulevard as the business route leaves the city of Ridgecrest. Photo taken 07/26/09. U.S. 395 Business approaches U.S. 395 southwest of Ridgecrest. Turn left for U.S. 395 south to San Bernardino and San Diego; turn right for U.S. 395 north to Bishop and Reno. Photo taken 07/26/09. Southbound U.S. 395 Business (China Lake Boulevard) ends at its junction with U.S. 395. Continue straight ahead to follow Brown Road (Old U.S. 395) northwest to Inyokern. Photo taken 07/26/09. Freeway entrance assembly for U.S. 395 north from California 70 north at Hallelujah Junction. Photos taken 09/09/05. U.S. 395 begins from a wye interchange with Interstate 15 north in the city of Hesperia. A half diamond interchange connects I-15 south with U.S. 395 north via Joshua Street west. Photos taken 02/20/05. Eastbound Joshua Street meets U.S. 395 in Hesperia. To the right is the southbound on-ramp to Interstate 15 toward San Bernardino. Straight ahead is the U.S. 395 northbound connection to Interstate 15 via a half diamond interchange at Joshua Street. Photo taken 02/20/05. Motorists continuing east on Joshua Street cross over Interstate 15 ahead of the northbound on-ramp to Victorville and Barstow. Photo taken 02/20/05. Near the intersection with Joshua Street, this view looks west across U.S. 395 toward the San Gabriel Mountains and the smoke caused by treacherous Station Fire of 2009. This blaze, which began on August 26, 2009, consumed large sections of Angeles National Forest (160,577 acres). The fire was contained on October 16, 2009. Photo taken 09/04/09. Typical landscape found along northbound U.S. 395 through the eastern Sierra Nevada. Photo taken 2000. The historic Mono County Courthouse, located north of U.S. 395 in Bridgeport. A ceremonial plaque provides a brief history of this old building. Photos taken 09/07/09. 02/20/05 by AARoads and Justin Cozart.